An ever imminent threat to the Awarua/Waituna wetland area is fire. At first this sounds counter intuitive as a wetland by definition is ‘wet’, so how does it catch fire? Historically fires are thought to have been sparked by rare events such as volcanic eruptions or lightening strikes. Early Maori and European settlers also brought fire with them and used it as a tool for clearing large areas of land. When conditions are right fire will take to the highly flammable manuka vegetation like a wild horse to a gate – the first opportunity it gets will have it galloping for miles. The wetland area is undergoing the constant process of successional regeneration. Currently regeneration is in the manuka phase and the area is densely populated with young manuka. The intense competition between plants results in dead material becoming trapped within the manuka plants contributing to their flammability. In older manuka stands there are fewer dead stems of fine diameter, but the strips of hanging bark also contribute to the flammability of manuka vegetation. Fire not only affects scrub and bush layers, but consumes litter and uncompacted peat, accentuates wind-drying and surface runoff of rain, and adds ash-fall nutrients to sites. 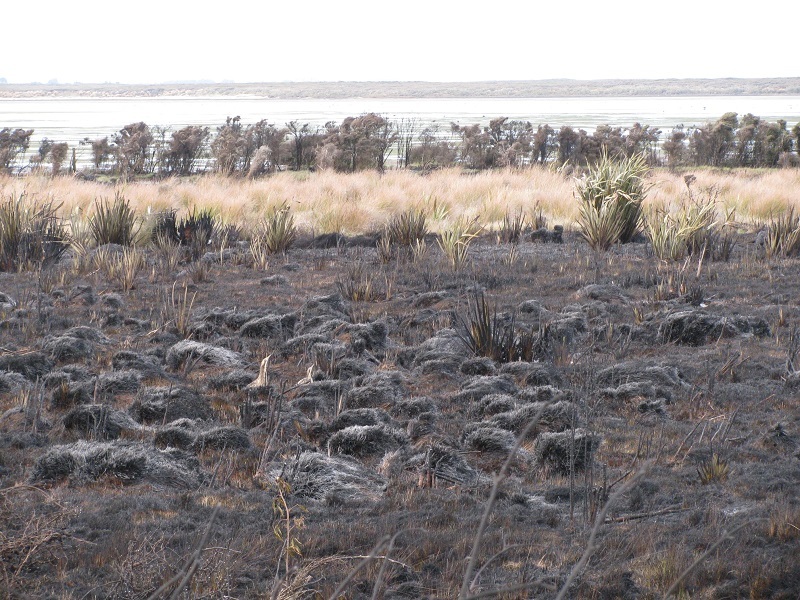 Although manuka often plays a rapid and useful role in re-establishing a native plant cover, repeated fires in the Awarua Waituna wetland area have brought about a compounding increase in manuka abundance and seed source and thus manuka assumes a greater presence after each fire. Unlike manuka the alpine cushion bog (Donatia novae-zelandiae) is particularly sensitive to fire and very slow to recover. Fire also provides open sites for gorse (Ulex europaeus) establishment and invasion by other introduced weeds such as Spanish Heath. Bittern after the October 2009 fire at Tiwai.Photo by Department of Conservation.